If your elderly loved one has diabetes then you already know how difficult managing their condition can be. Diabetes can affect nearly every part of the body, even parts you wouldn’t normally associate with diabetes such as the eyes. For those with diabetes, a condition known as diabetic retinopathy can be a big concern as it affects their vision. The complication damages the blood vessels of the retina’s light-sensitive tissue, potentially causing blindness. The condition can develop in anyone who has type 1 or type 2 diabetes. The longer someone has diabetes and the less controlled the blood sugar, the more likely they are to develop eye complications. If your loved one has diabetes, our resources are here to help you protect their vision and improve their quality of life if they are living with a diabetic retinopathy-related impairment. Learn the symptoms, causes, treatment, and more of diabetic retinopathy here. With diabetic retinopathy, the initial stages are typically asymptomatic. When signs are present, the first sign is typically floaters, distortion, and blurred vision. In addition to these symptoms, your loved one may experience impair color vision, dark or empty areas in their vision, or vision loss. Diabetic retinopathy occurs when the tiny blood vessels that nourish the retina are blocked. This occurs when there is too much sugar in the blood. As a result, the eye may attempt to grow new blood vessels, but many times, the new blood vessels don’t grow properly and start to leak. There are two types of diabetic retinopathy – early diabetic retinopathy and advanced diabetic retinopathy. 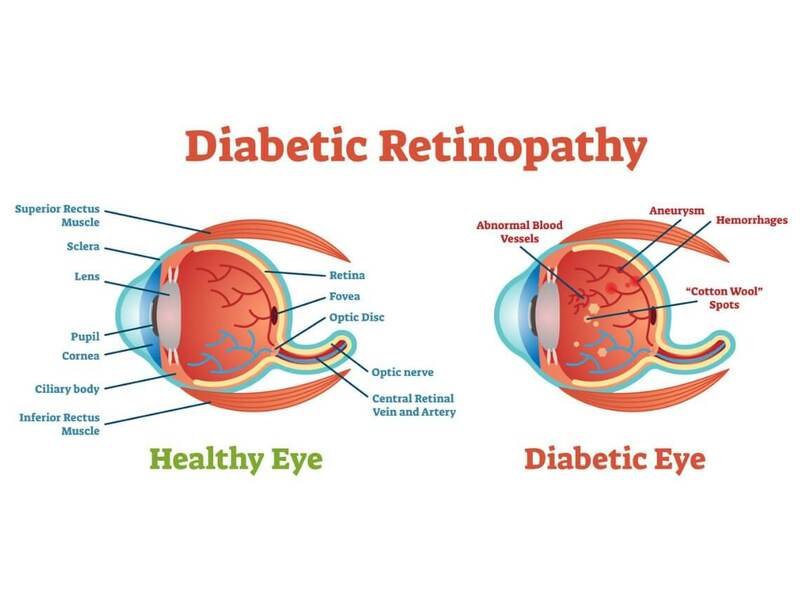 Early diabetic retinopathy is also known as nonproliferative diabetic retinopathy (NPDR)and is classified by weakened blood vessels in the walls of the retina. NPDR also causes tiny bulges to protrude from the vessel walls of the smaller vessels, which can cause fluid leakage in the retina. As this progresses, the nerve fibers in the retina may begin to swell and require treatment. Advanced diabetic retinopathy is less severe than NPDR but can progress to it. With this type of diabetic retinopathy, the damaged blood vessels close which causes new, abnormal blood vessels to grow in the retina. This results in a clear, jelly-like substance that can leak into the center of the eye. As this progresses, scar tissue can form, causing the retina to detach from the back of the eye. As new blood vessels associated with diabetic retinopathy grow, the pressure in the eyes can build up – a condition known as glaucoma. Excess pressure in the eye can damage the optic nerve, resulting in vision loss. Diabetic retinopathy is associated with abnormal blood vessel growth in the eyes. This abnormal growth can create scar tissue which can pull the retina away from the back of the eye. Diabetic retinopathy can cause the new blood vessels to bleed into the clear, jelly-like substance that fills the center of your eyes. If too much blood leaks, it can fill the vitreous cavity, resulting in blocked vision. Diabetic retinopathy can eventually lead to complete vision loss. Diabetic retinopathy is diagnosed with a comprehensive dilated eye exam. During this exam, a drop placed in your loved one’s pupils will allow their doctor to view the inside of their eyes. During the examination, the doctor will look for abnormal blood vessels, swelling in the retina, bloody and fatty deposits in the retina, new blood vessel growth, scar tissue, bleeding, retinal detachment, and other abnormalities. Your loved one’s doctor may request a fluorescein angiography exam or an optical coherence tomography (OCT) exam. The former uses an injectable dye to pinpoint issues within the blood vessels of the eyes. The latter is an imaging test that provides cross-sectional images of the retina. Treatment will depend on the type of diabetic retinopathy your loved one has, as well as how severe it is. Depending on the type and severity, the doctor will determine if treatment should be geared to slow or to stop the progression of the condition. Early diabetic retinopathy may not need treatment right away. Instead, your loved one’s doctor will monitor their eyes closed to determine when and if treatment is eventually needed. Their doctor will also likely suggest ways to improve their diabetes management, since healthy blood sugar levels can usually slow the progression. If your loved one has advanced diabetic retinopathy, they will need surgical treatment. The type of treatment will depend on the specific problem(s) within the retina and may include photocoagulation, pan retinal photocoagulation, a vitrectomy, or injectable medicine. Each of these treatments varies, but essentially work to remove scar tissue, abnormal blood vessels, and blood. When it comes to preventing diabetic retinopathy, there are a few things you can do to help keep your loved one’s eyes healthy. Make sure they have regular eye exams, control their blood sugar and blood pressure, and address any changes in vision right away. If your loved one does experience a change in vision – especially sudden blurriness, haziness, or spottiness – call their doctor right away. The American Optometric Association recommends that individuals over the age of 60 receive annual eye examinations. If you’re a family caregiver juggling duties, life at home, and a career, it’s often difficult to provide loved ones with the necessary level of care, including transportation to and from appointments.